Over the 20 years before President Abdelaziz Bouteflika resigned on 2 April, Algeria-watchers took to comparing the political outlook to making mayonnaise. Resistance to poor services, graft, maladministration and crony capitalism drove thousands of demonstrations every year, but a mass movement that could sweep away le pouvoir ('the powers that be') had never gelled since the civil war with radical Islamists ended. A wise head in Algiers advised a young activist to curb his enthusiasm for the forced resignation of President Abdelaziz Bouteflika: 'Don't call this a revolution. At best it's a revolt… we don't even know if the flight of Ben Ali from Tunisia was a revolution yet.' 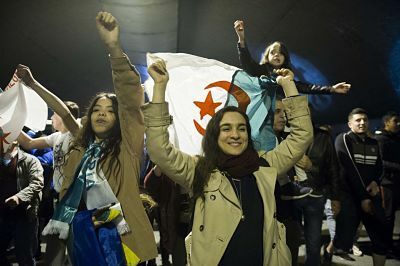 Indeed, many think that the ruling Front de Liberation Nationale will find ways to turn the seven weeks of street protests and Bouteflika's ousting to their advantage. Standing against them is an ineffectual opposition and a broader but more youthful coalition of activists. The protest season shows no sign of ending. Liberation parties that took power a generation or more ago have struggled to renew themselves. The revolutionaries-turned-elite members in Zimbabwe, Angola or Mozambique, have lost support. Cyril Ramaphosa is working hard to hold onto the African National Congress's support base while reforming it at the same time. None of those political systems are as opaque as Algeria's. Yet Algeria has one of the liveliest and most independent-minded presses in Africa. The protest movement against Bouteflika and for free elections mobilised over 10 million people in a matter of weeks. It does not agree on its aims – although many speak of a national conference to redraw the constitution and its political system – but it is clear what it rejects. There is absolute opposition to Algeria following Egypt's trajectory: the army removing one autocrat only to replace him with a still more repressive military man.